My name is Adrienne Howells and I am an Art and Embroidery Tutor in Exeter Devon – I have approx. 70 students altogether in my classes. My father fought with the Eighth Army in Tobruk, El Alamein and Monte Casino – I was fortunate he came home. The government requested we ‘remember’ World War 1, for next year is the 100 year centenary. Because of what happened to my father and what he did I felt I needed to do something in memory of those who never returned from that dreadful war. I exhibit both Art and Embroidery at the big Craft for Crafters Exhibition held at Westpoint each January and I felt that maybe this would be a good place to start the memories and begin a public project. Andy Thorpe, the Director of Craft for Crafters, liked the idea and is fully supporting the project. We are making a large wall hanging – the centre will be painted with images of the war, there will be two side banners flanking the wall hanging these will have metallic leather Poppies appliqued on to the centres. The idea would be to get the public to donate a British Legion silk poppy and to write the name of a family member who fought in the war onto the poppy. The poppies would then be stitched around the wall hanging and the banners. If the person donating the poppy did not know of a family member who fought in the war then there would be a list of names of service men from Devon from whom they could choose to honour. More banners could be made should the public donate enough poppies. Both my classes will be producing Poppy themed pictures which can be displayed . South West Quilters are kindly creating and donating a Poppy themed Quilt which we hope to raffle at the different venues. I would also like to have small pen picture memories from the public of experiences their families had during this time ideally linked with a photograph of the period. Suttons seeds will be donating red field poppy seeds, that we could give to families with children. The idea being that it would reinforce the history of our country to the next generation – consolidating what they have learnt from the project by actually sowing seeds for the future. I believe that just a few seeds per packet would make them far more precious and special to the children. We hope to start the journey of the project with the one remaining WW1 widow putting the first poppy onto the hanging, The British Legion have this contact and would be hoping to involve TV and press coverage but as with all things this would be dependent on the whims of the media. The project would then be taken around Devon, the project can be expanded or reduced to fit whatever space is available. Killerton have already booked the Spring Half Term week and are looking into having the quilt back at the end of the year in November. I have requests from the villages of Upton Pyne and Bradninch, also Dartington, Arlington Court and Drogo. If you have any family history about WW1 – and any photographs you could send copies of (Not originals) – we hope to show these snippets along-side the banner and eventually collate these memories into a book to sell proceeds to go to RBL to help support our troops of today. For the members who weren’t at the AGM or the Summer Day, South West Quilters are in the throes of making a quilt in response to a request from the British Legion, to mark the 100th Anniversary next year of the first World War. We now have 50 plus poppy blocks, all made by members, and Christine and I are putting together 49 of them to form, what we hope, may resemble a poppy field. The rest of the blocks will be put together to form a bag for the Quilt, but which can eventually be utilised to become a Lap Quilt. As British Legion are having Raffle Tickets printed and needed a name, the Committee decided we should call it ‘Every Stitch a Memory’. SWQ will not be responsible for selling any of these tickets, but as the Quilt will be finished and on show at our Christmas Meeting, anyone who wishes to will be able to buy one. The Quilt will be officially presented to the British Legion on the first day of Craft4Crafters in January, at Westpoint, which we hope will be the first stop of many, on its way around the County during the year, raising much needed funds. 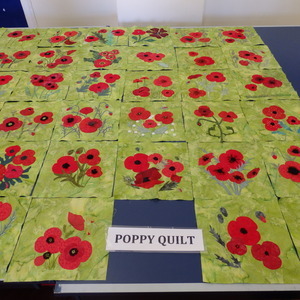 One last thing – whilst I was standing by the table last Saturday collecting in the poppy blocks, one member whispered to me “wouldn’t it be lovely if a South West Quilter won the Quilt, then handed it back to the British Legion, to hang in their Headquarters”. Now there’s a thought girls. Who will be the first to pledge just that? The Quilt is going together very nicely, and looks gorgeous! We are both looking forward to sharing our delight with you all at the Christmas Meeting.